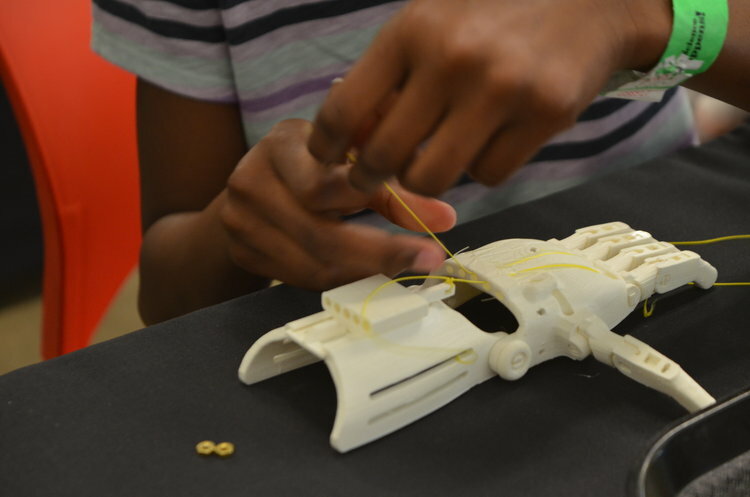 During a workshop at Fab Lab Carnegie Science Center, a student works to string the fingers of a prosthetic hand. Ten children in war-torn countries who are missing all or part of their hands are now able to hold a cup, open a door, and pick an apple, thanks to small hands created by Allegheny County youth. 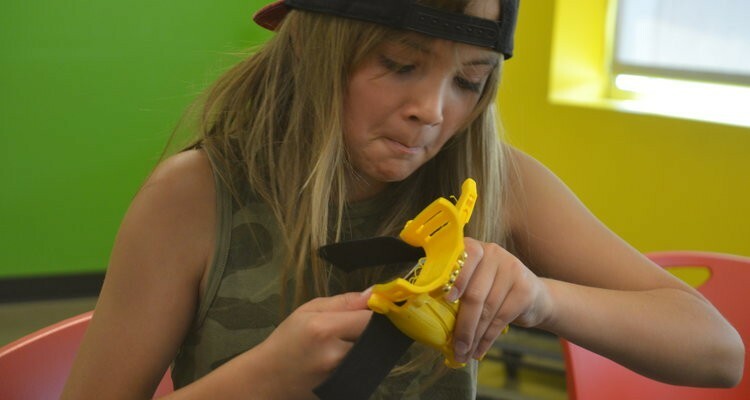 Throughout the spring, 17 local students worked together at the Carnegie Science Center’s Fab Lab to 3-D print and assemble 10 child-sized hands. The hands will be distributed to their peers, either in the United States or overseas to children who lack hands or digits as a result of violent conflict. Known as Raptor Reloaded, the Fab Lab’s hand model is part of a long evolution of open-source designs provided by Enable Community Foundation, a loose-knit group of nonprofits that invent, share and print prosthetic hands. North Carolina-based Prosthetic Kids Hands Challenge matches the locally made hands to children in need. 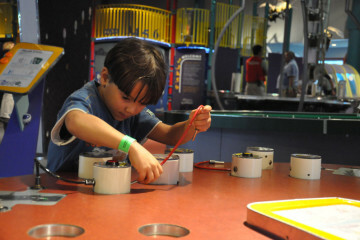 Last month, the young makers from Gateway, North Allegheny and North Hills High Schools, charter schools, and Pittsburgh Public Schools, among others, presented their work during a public workshop at Carnegie Science Center. Made of black-and-gold nontoxic polylactic acid plastic printed on three printers, the left and right hands require a functioning wrist to work. The hand straps around the wrist. The child controls the gripping movement of the hand with a set of pins and tension strings on the back of the hand. Liz Whitewolf, Fab Lab manager at Carnegie Science Center, says she was especially impressed by the way the young manufacturers started to think more globally about how they could affect the world through maker projects. The recipient of this hand will use this Velcro strip to attach the hand. Traditionally, prosthetic hands have been custom-made at medical facilities; by outsourcing the manufacturing to groups such as the Carnegie Science Center—which is willing to donate the 3-D printing technology— prosthetic hands are more accessible and affordable, Whitewolf explains. A $30,000 grant from Three Rivers Workforce kicked off the project, known as the e-Nabling the Future 3-D Hand Printing Program, in November. Volunteers, including an orthopedic surgeon and a medical student, consulted on the project before the teens began printing and assembling in February, spending three hours every week learning hands-on skills and applying them to a very real-world situation. “It was surprising how motivated they were to show up in the evenings for eight weeks in a row,” Whitewolf says. The Fab Lab is currently looking for more funding for another round of 3-D hand printing.